Have you heard about the sixteen-year-old who posted a selfie in which she proudly displayed her brand-new driver’s license and credit card? Many of us have done questionable things online—hit “send” too fast, forwarded a work rant to our boss instead of our BFF, gotten into a flame war over political opinions—and recovered. Small mistakes are forgivable, but our students need to learn how to make smart, safe, savvy digital decisions. Here are some examples of how different districts are handling this issue. 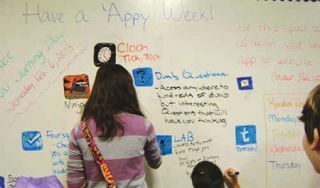 Students learn about public sharing by contributing to a sharing wall at the Elkins Pointe Middle School (Fulton County) library. That philosophy carries over into how the district teaches everyone about digital citizenship. After a team evaluated the current offerings on the subject, they discovered that there was a lot of focus on tech integration to improve teaching and learning but not enough on digital citizenship. This summer, they revised their digital citizenship curriculum with materials from Common Sense Media (commonsensemedia.org), PebbleGo (pebblego.com), and Rosen Digital’s digital literacy database (rosendigital.com). ► BrainPOP and BrainPOP Jr.
One of NYC Public Schools’ infographics on digital responsibility. In 2012, the New York City (NYC) Department of Education created social media guidelines for staff. Lisa Nielsen was appointed to the newly created role of director of digital literacy and citizenship to support the rollout of the guidelines. Since then, she has worked to support her district to help ensure that staff, students, and their families engage responsibly online. Nielsen does this by providing professional learning opportunities and by working with teachers, students, and their parents to create materials such as guides and activity books. Nielsen’s team partners with Common Sense Education and EverFi to offer digital citizenship classes for teachers throughout the year. Nielsen says teachers like these programs because they include authentic lessons and engaging interactive digital programs like EverFi’s Ignition and Common Sense Education’s Digital Passport, Digital Compass, and Digital Bytes. Nielsen also educates staff in person and through her blog, The Innovative Educator (InnovativeEducator.com), about how to use social media to enrich teaching and learning. She shares real-life stories of teachers using social media with students to support academic, career, and social success. She provides examples of what happens when people don’t act responsibly online and the consequences they face as a result. In addition, digital citizenship is a frequent topic in the monthly #NYCSchoolsTechChat that Nielsen hosts with co-moderator and tech teacher Eileen Lennon. One of the more popular topics this year was digital drama and confrontation. You can check out the chats here (participate.com/chats/nycschoolstechchat). Denver Public School students improving their digital citizenship knowledge and skills. The 150 schools in the Denver (CO) Public Schools have flexibility when it comes to choosing their curriculum, but they’re all required to teach digital citizenship. Many of the schools use Common Sense Media’s curriculum, starting in elementary school, and a lot of teachers have become certified through Common Sense and can train other teachers. Teachers also use BrainPOP’s self-paced modules on Internet etiquette. This month, as the district launches a 1:1 Chromebook initiative at 15 schools, Education Technology Coordinator Brian Dino will run an hour-long program on digital citizenship at each of those schools. “Three students have had to leave school because of oversharing online,” he says. “We don’t want to scare them; we want to help them learn how to be positive online.” In addition, all ninth-grade students will participate in lessons on digital citizenship during the first week back at school. Teachers in New Prague continually work with students on making smart decisions online. That’s why his district strives to talk about digital citizenship whenever the opportunity arises, and in a 1:1 environment that’s fairly often. “It doesn’t have to be huge lesson. Just a comment as students are logging in to remind them of the importance of protecting their password and to not even share it with a friend goes a long way,” he says. New Prague, which is 1:1 Chromebooks for grades 3 through 12, doesn’t have a formalized digital citizenship curriculum. But Brandt sends a tech-integration newsletter to teachers every two weeks that includes digital-literacy tips from Common Sense Media. His goal is to get teachers to incorporate the tips and other digital citizenship lessons into their everyday lessons. “We are trying to get past that mindset of this being something extra. A teacher can have a quick discussion with students about being respectful in the classroom and ask how they show respect online,” he says. Township High School District parents learn about Internet safety and more at the local Apple store. When Township (IL) High School District 214 looked into how they were teaching digital citizenship and Internet safety, they discovered that students were learning about bullying and cyberbullying in health and about copyright laws in English. Students were also receiving general information during freshman orientation and attending forums delivered by guidance counselors, but the district felt there were even more opportunities to address these topics. This year, the district is adding a digital literacy course for freshmen. “Students will have the whole year to finish the course,” says Gabriella Stetz-Jackson, district coordinator for teaching and learning. “We’ll pace them and give them incentives along the way.” The first part of the course focuses on being successful in Schoology, Infinite Campus, Notability, and other district programs; the second half concentrates on digital literacy. In addition to making sure students were learning what they needed, the district has done a lot of work to help parents navigate the world of digital citizenship—and particularly the intricacies of social media. When the district went 1:1 and held sessions for parents about the initiative, they saw the need to offer more support for parents. “We had an Engage event with our feeder districts,” says Keith Bockwoldt, director of technology services. “We held it on a Saturday and had sessions on Google Classroom, Notability, and other topics. Parents were very interested.” The district partnered with their local Apple store (at the Woodfield Mall) andoffered free evening sessions at the store for parents to learn about the 1:1 iPad program, the district philosophy, and how Apple offers support. “The Apple Geniuses knew how our 1:1 worked and helped parents with whatever they needed,” says Stetz-Jackson. In addition, she and a district colleague created a six-week course for parents to learn about digital citizenship, social media, and iPads in the classroom. The social media section discusses how the district and teachers use social media, focusing on the positive, and also includes information about the sites students use and offers suggestions for how to discuss the topic with their children. Parents who finish the course receive a certificate of completion, and their names are forwarded to the Board and superintendent. “They do it on their own time and recommend it to friends. We even opened it to incoming parents so they can prepare ahead,” says Stetz-Jackson. Be Internet Awesome: Google’s new digital citizenship and safety program was developed in collaboration with the Family Online Safety Institute, the Internet Keep Safe Coalition (iKeepSafe), and ConnectSafely and includes resources for kids, educators, and families. BrainPOP Digital Etiquette: A free movie that teaches about the dos and don’ts of netiquette. It covers the different types of digital communication and how to bring courtesy and respect back to the Web. Includes lesson ideas, too. Common Sense Education Digital Citizenship Curriculum: Used by more than 300,000 educators and administrators worldwide, this K–12 program includes resources to help students, teachers, and families navigate cyberbullying, Internet safety, and other digital dilemmas. NetSmartz Workshop: From the National Center for Missing & Exploited Children, this site offers resources to help teach children ages 5–17 how to be safer both on-and offline. It features videos, games, activity cards, and presentations for parents and guardians, educators, and law enforcement.